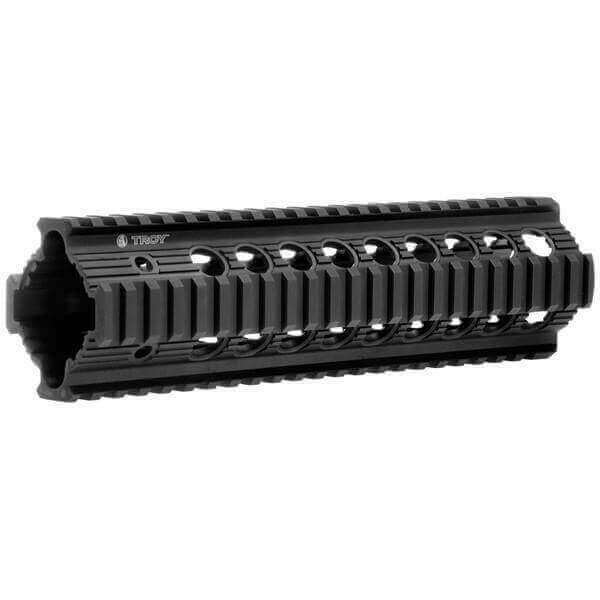 Troy Bravo Rail 9″ Free Float Quad Rail. Troy’s Bravo rail is a one piece free floating quad rail design that utilizes the existing barrel nut and revolutionary tri-clamp system. This easy to install, one-piece free float hand guard offers unlimited mounting solutions with four full-length true U.S. MIL-SPEC 1913 Picatinny rails, breakthrough tri-clamp locking system, enhanced accuracy and reduced heat transfer. Machined from aircraft aluminum and finished in MIL-SPEC Type III hard coat anodized with Teflon®. You guys are awesome! Not only did the customer service lady put up with, what I deemed, incessant question asking, she also helped me find EXACTLY what I needed. This is my first AR build, and I know for a fact that for future builds, I will be returning to AT3 Tactical!